1. Keep only the items you use every single day in your medicine cabinet. Leave room for the basics like your toothbrush and skincare. 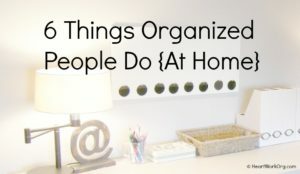 At least that part of your routine can be simplified to just one product for each step, even if you have a million choices for color and finishing touches. 2. For beauty items that coordinate with your outfit or the season, like blushers, eye shadows, and lip color, group them together by category so you can see your choices at a glance. 3. Use clear acrylic drawer dividers or decorative boxes to hold groups of each makeup type in drawers or on shelves. 4. Use wall space by adding bins like those found in kitchens to hang utensils. Add magnetic or hook and loop (Velcro) fasteners to hang items in plain view on the back of the medicine cabinet door. The back of the bathroom door can offer even more storage space with the addition of a clear see-through shoe pocket organizer. 5. The under-sink space is super-high value real estate. 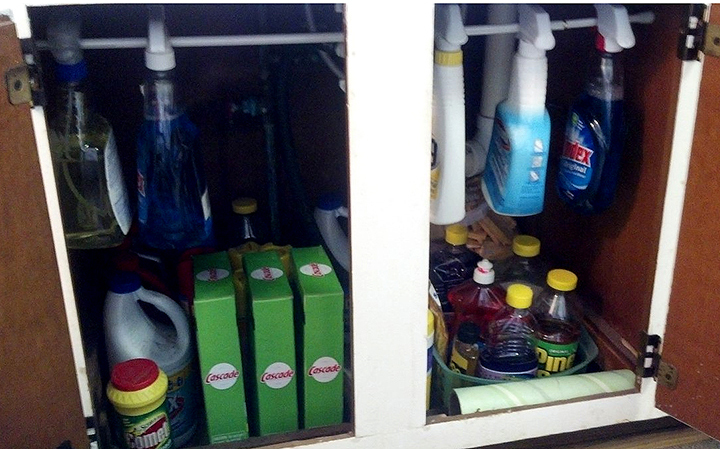 Use a 2-tier sliding organizer to make use of all the room under your sink, and to reduce spills and messes. 6. 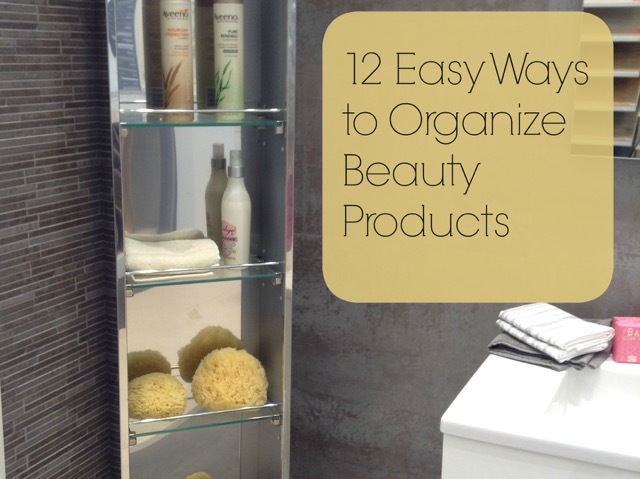 Minimize the amount of beauty product in your tub area. Find a shampoo and body wash that the whole family enjoys using rather than tripping over multiples. 7. Most tubs don’t have much built in storage. 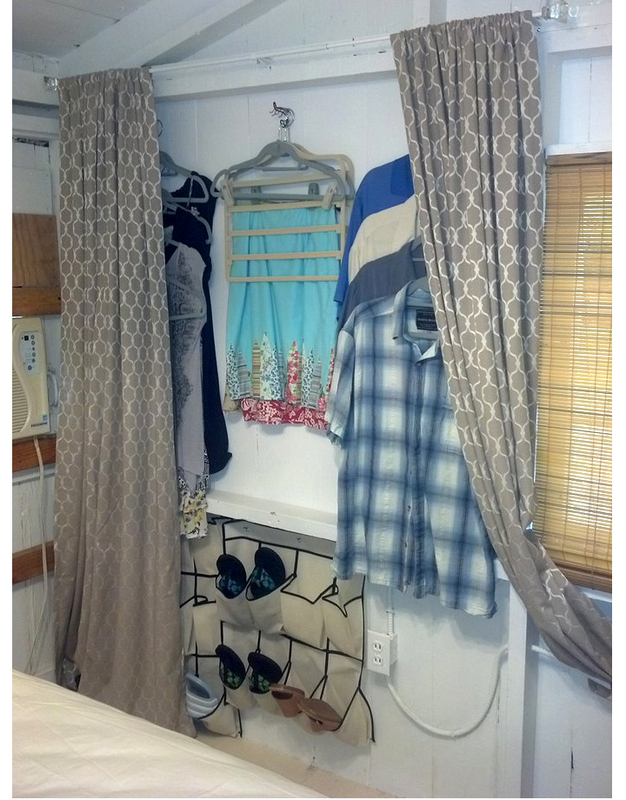 Add racks that hang over the shower head and offer 2-4 shelves to hold beauty products and gear. Or suspend another shower rod on the inside back wall at eye level to hold baskets that can hold even more beauty items or bath toys. 8. The 80/20 rule applies to most beauty products. We usually use 20% of our products 80% of the time, and most products get used barely at all. Decide which items are your favorites, and pack the rest away for a month. If you don’t go back into the box to retrieve any of those items, you can probably do without them altogether. 9. Repurpose whenever possible. Use mason jars, wooden boxes that were original packaging for nicer beauty products, and small tin pails from the garden department to help you sort items together and make them look nice. 10. Even simple plastic bins from the dollar store can look great if they are in the same color scheme and labelled nicely. 11. Update your light bulbs. 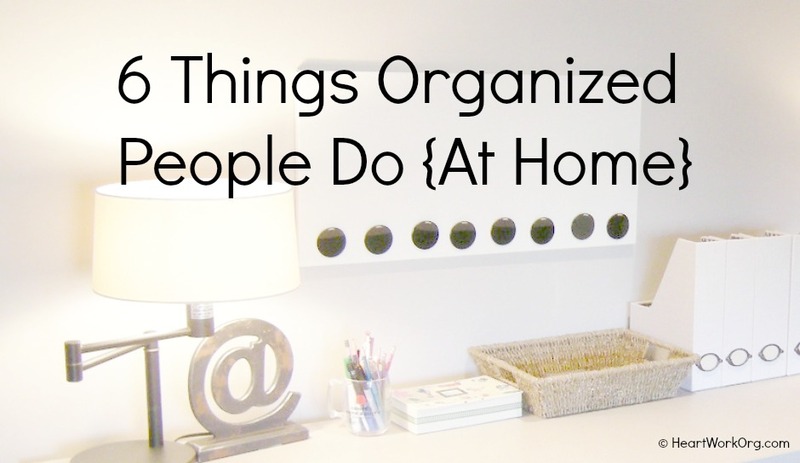 It’s hard to organize what you can’t see. 12. If you are updating your space, ensure there are plenty of drawers to store your beauty products in. Most basic vanities don’t come with drawers. With drawers, you can easily separate your beauty stash and keep your counters clear so you have room to prep each morning.